With Adam Silver taking over for David Stern as NBA commissioner on Saturday, Mark Tatum, the league's vice president of global marketing partnerships, has emerged as Silver's successor to become deputy commissioner, league officials told Yahoo Sports. Tatum, who is African-American, will become one of the highest-ranking minority executives in major professional sports. Tatum must be formally approved by the league's owners. 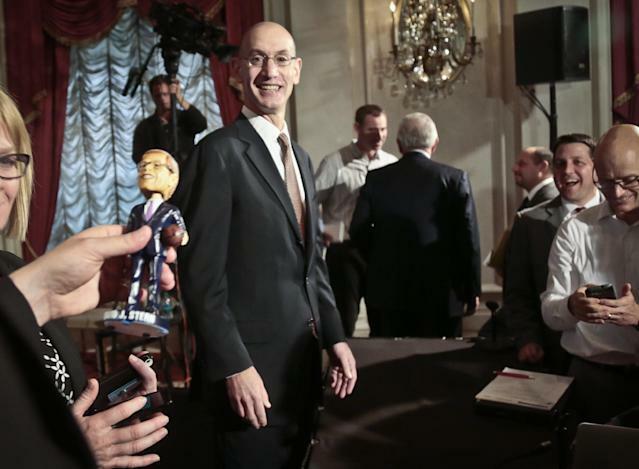 Silver had been the NBA's deputy commissioner, and had long targeted Tatum to take over his No. 2 position in the league office, sources said. Several league officials describe Tatum as bright, capable and engaging, an executive who has spent most of the past 15 years as a revenue creator for the NBA. Tatum has overseen the league's marketing partnerships with major corporate brands, and managed sales relationships with the league's TV and media partners. As one league executive told Yahoo Sports, "Mark is extremely bright and talented, a guy who has the ability to be well-respected and well-liked." "He's a good and smart guy," said an executive who has worked closely with Tatum. "He'll need to grow into the position. I'd imagine most front-office people aren't familiar with him." Before joining the NBA in 1999, Tatum worked for Major League Baseball. He's a graduate of Cornell and Harvard Business School.